Autistic children often have poor handwriting. 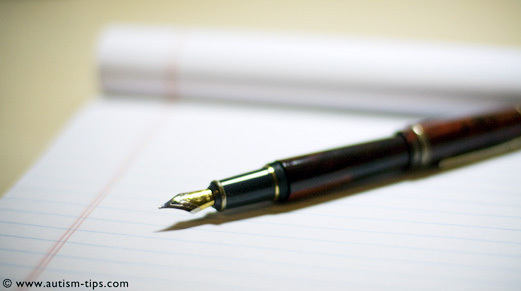 Here are 5 tips to help improve their handwriting. 1- Try different types of pencil grips until you find the most appropriate one. The ones over the counter are cheap so sometimes it is worth trying them and they work for some kids pretty well. The better ones are available in specialized catalogues or websites and stores selling occupational therapy materials. The price ranges from $12 to $15. 2- The fine motors can improve simply by ripping paper, cutting paper along different lines: straight lines or shapes (circles, ovals, squares, zigzag…), playing with play-dough and ask the child to squeeze, roll and pat to make different shapes. 3- We always forget that the kids grow older and taller and they need a desk-chair readjustment accordingly. The child’s arms should make a right angle when she rests them on the desk. They should be almost at the waist line level and never higher. Besides, the posture is very important. The back should be straight and both hands on the desk and the paper should be turned a little bit either left (if right-handed) or right (if left-handed). By doing this there is enough assurance that the child is looking from the right angle. In some cases, sitting on a bubbly cushion has a comforting and calming effect. Keep reminding the child to maintain the correct posture. 4- The use of a slanted board is highly efficient for kids who press hard on the paper with the pencil to the point of making holes in the paper. The slanted (slightly lifted) board forces the child to reduce the pressure on the paper. 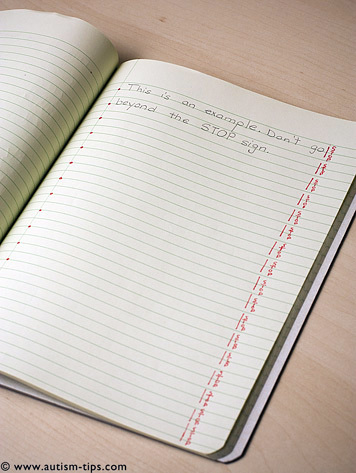 A cheap way to create a slanted surface is to use an empty binder (an inch or more, depending on the need) to write on. If you want a sturdy wooden board, you can find one in specialized stores that sell occupational therapy materials. 5- Most autistic children have a GIGANTIC handwriting. I have a tip that worked magnificently well: Use narrow-lined thick paper (paper with only horizontal lines). Model, by writing the first sentence, showing the appropriate size you want the child to emulate. Then mark a dot at the beginning of each line to show where the writing should begin, using a red pen. At the end of the line, draw a vertical small line to indicate that no writing should be done beyond this point and write the word “STOP”. See the example below. Incredibly insightful. I like the way you write. Do you provide an RSS feed? Thank you for nice comment. Yes, this is a WordPress theme, I am glad you like it! Thank you so very much, you made my day. I admire your website , it’s filled of lot of information. You just got a perennial visitor of this blog! Your kind words will help keeping me writing. Thank you! Thank you for your support, it is highly appreciated. Thank you! 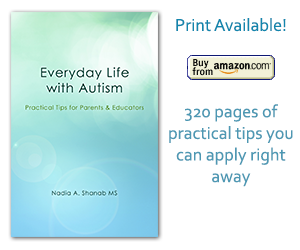 I am passionate about the topic “autism” that is the reason for which I try to publish frequent articles. I wish you all the best.